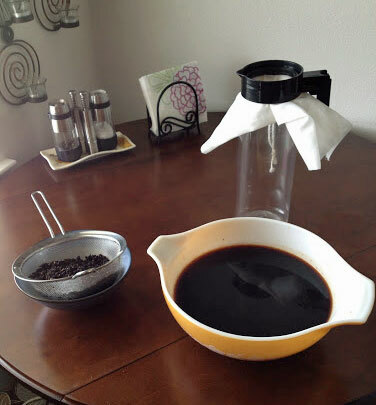 How to make cold-brew coffee concentrate with natural chicory and anise flavoring. 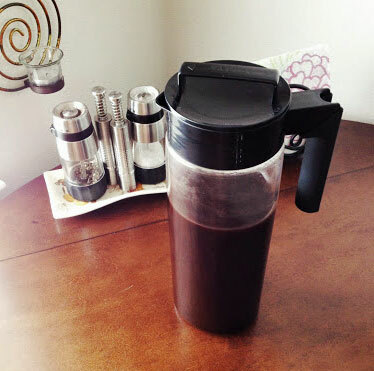 Note: This cold-brew coffee recipe, plus all instructions and photos, were submitted by Jesse Cohen. Thanks Jesse! 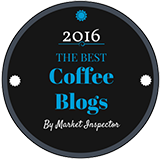 If this coffee recipe with chicory and anise sounds good, and something you would like to try, simply follow these step-by-step instructions. Step 1. Gather together the ingredients. For this batch I will be using 7 cups of water, but enough grounds for 6 cups. More on that in a minute. Go ahead and assemble your ingredients. Step 2. Prepare the equipment you’ll need. You will also need a large pitcher of some sort. 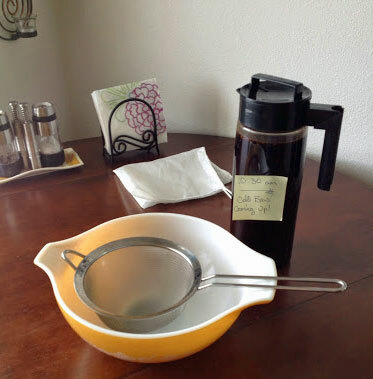 The locking lid style pictured here isn't strictly necessary, but it has some advantages as you will see. It holds about 8 cups total. Also, you should grab a digital kitchen scale, for consistency in measuring, along with some measuring implements. 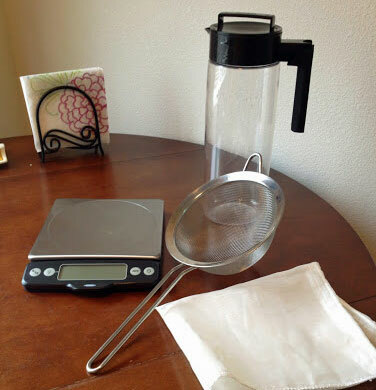 For the next day, you'll want a medium to large sized metal mesh strainer, and a secondary filtering method. Currently I'm using a nylon brewer's bag with fine mesh. More on that once we get there. Not pictured are an 8-10 inch non-stick pan, and extra large mixing bowl. Now, to the brew! 3. Weigh the ground coffee. So we start with our kitchen scale. Place the cup on the scale and zero the scale to account for tare weight. 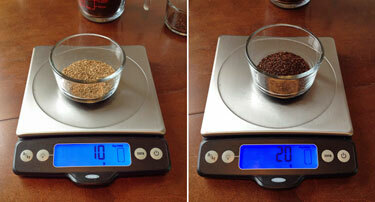 Then measure out your coffee to 120 grams. 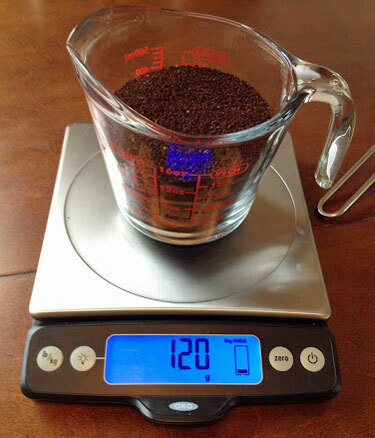 If your scale is analog, just measure the weight of the cup or bow first and note it somehow (some scales have markers you can move around, or a post-it works too), then measure off the grinds from there. Note: You'll notice I called for 120g in 6 cups of water, with 1 cup leftover (this'll be for the other flavorants). 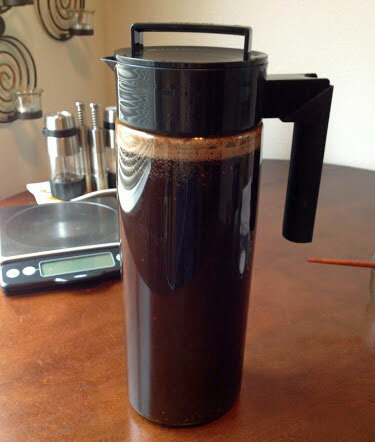 After much research and testing I have found my personal sweet spot for cold brew coffee concentrate is 20 grams coffee for each 1 cup of water. There is much debate on this topic, but for final flavor, concentration, and cost, this is my preferred grind size and golden ratio. Feel free to tinker if you feel the need! Step 4. 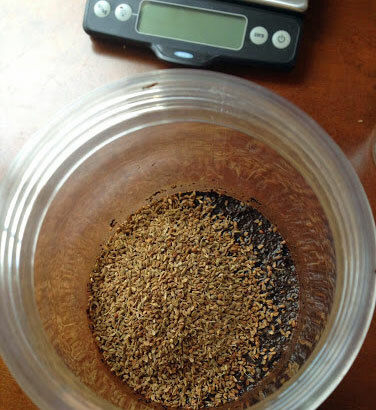 Next measure out your chicory and anise. Note: Both the spices were found at my local Whole Foods, in the bulk spice section, and they were surprisingly cheap. Cost Plus World Market has been known to carry unique spices like these, but online is always an option if no local spice purveyors can be found in your area. Also, I experimented with Star Anise too, but the seed is a whole lot easier to deal with, and produces a richer flavor for this application. Step 5. Heat the anise. 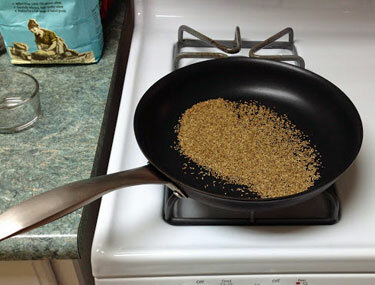 Using the small nonstick pan, heat your Anise Seed on low to med-low heat. The goal here is to lightly toast the seed, activating the oils in the tiny shell. Just shuffle the pan from side to side every minute or so, moving the seeds gently. They will start to change color slightly, and you will notice the aroma of licorice fill the air. Once that happens pull them off the heat. Over my gas range, this takes about 6-8 minutes. Step 6. Mix the ground coffee and water. Now to the mixing. 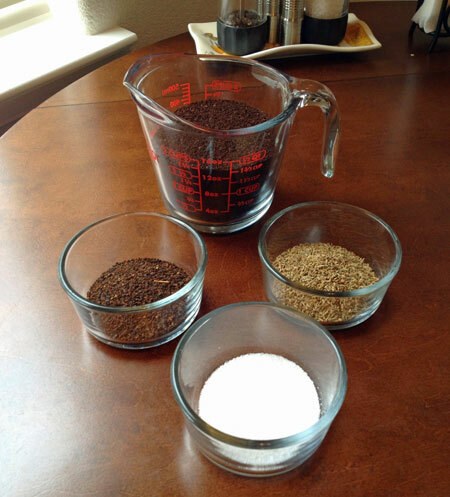 Dump all the coffee grounds in your pitcher and pour on the first 4 cups of cold water. Mix until the water has saturated the grinds thoroughly. Note: Regarding water. Important stuff, that. Especially when making coffee. I live in the country, and our well water is amazing, so I use what comes out of my tap. 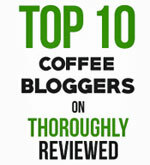 For you city dwellers, if you don't drink your tap water, don't use it in your coffee. Just don't. If you use a filter, make sure it is fresh filtered, same day (like Brita or Pūr). Reverse Osmosis is NOT preferred, nor is Distilled. You want some oxygen, and mineral content, just no icky metal or sulphur flavors in your water. Trust me on this. Step 7. Add the chicory and anise. Now top off with the Chicory, Anise, and salt. Mix to combine and saturate, then add the last 3 cups of water. Step 8. Seal the mixture in a pitcher and shake it up. You'll notice this is where I have reassembled my pitcher, and screwed the lid down tight. This is where this design excels. It eliminates over exposure to the air during its long stay on the counter. This keeps the concentrate tasting fresh for the full 2-3 weeks it is good for. It also allows the next step to happen easily. After about 10 minutes, you'll notice most of the grounds are sitting like a plug at the top of the pitcher. I want maximum contact with the water for the next 24hrs. So with the airtight lid secured, I simply shake the living tar out of it, until all the grounds are floating free. One post-it to mark the time (easier than an alarm, but whatever works for you. ), and I leave this in a cool place (not the fridge), and walk away. Note: If your pitcher doesn't have a lid, plastic wrap and a rubber band work just fine too. Whatever keeps the air out. Step 9. Strain the mixture. Next day, at the appointed time, we strain. Holding the strainer over your mixing bowl, gently pour the grounds into the strainer, while your liquid runs through to the bowl. This will take some patience. Try to tap out as much of the grounds as possible, but don't worry if some stay stuck behind. Hold it for a minute or two to allow as much of the liquid to drip through. Step 10. Strain it again. With the liquid separated from the grinds, you can do your second strain. I have a second pitcher, but rinsing out the first one before moving on to this next step is also just fine. Taking advantage of the lid configuration, I double over the nylon bag so that the concentrate will pass through 4 layers of mesh. Again, rubber bands could be used here. I make a depression in the mesh, and lightly screw down the handle piece, just so it holds the mesh in place. Now we pour the concentrate slowly from the bowel, through the mesh. Admittedly this is mostly a visual thing, but it also affects the taste if you heat the concentrate up later for hot coffee. This should eliminate most of the fine grounds and make the final liquid a lot less cloudy. Pour steady and slow and a lot of those heavy, fine grounds will remain in the bowel, as they settle pretty quickly. 11. Tadah! 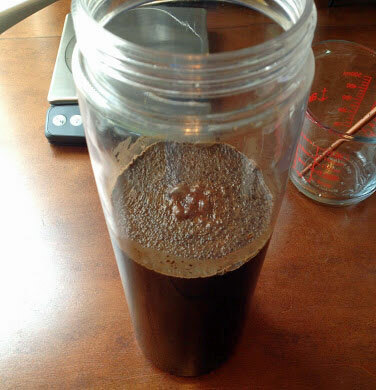 Homemade cold brew concentrate. Screw down the lid (or whatever you did during the brewing process) and store in the fridge for 2-3 weeks. stuff like a extruded espresso shot. 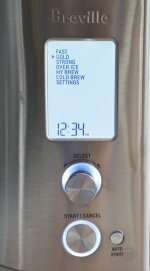 I mix 1:1.5 or 2, concentrate to water for a normal cup of coffee, 1:1 for coffee ice cubes. But I also play. Experiment yourself, and let us know what you come up with! Try these cold coffee drinks recipes.